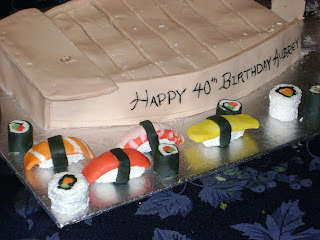 Dame Named Redd Designs: 362 - Sushi Cake Anyone? 362 - Sushi Cake Anyone? Look how wicked talented my sister is! She made this cake and decorated with moldable chocolate for her husband's birthday. All those sushi pieces are made of chocolate! Wow, that is incredibly cute!! 367 - Show and Tell! 365 - TNT is Dynamite! 364 - Lookie What I Made!